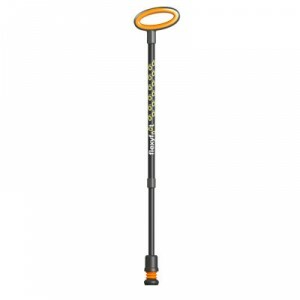 Flexyfoot Telescopic Walking Stick With Soft Handle. Funky and functional, that’s our new adjustable, telescopic Flexyfoot walking stick. Born out of a desire to inject some design and style into walking sticks and hiking poles, our new Flexyfoot sticks have an oval handle that is soft and comfortable to use. And of course our iconic Flexyfoot ferrule is already fitted as standard! 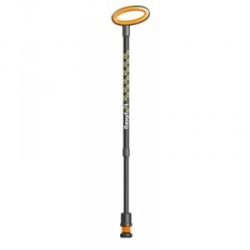 The adjustable, telescopic design also allows you to alter the height that you would like your walking stick to be so it can be as comfortable to use as possible. 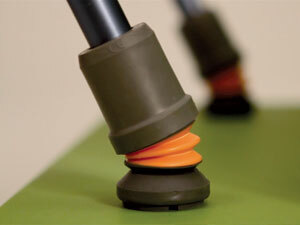 Flexyfoot is an award-winning new type of rubber ferrule that fits onto the tip of your walking stick or crutches. It is a British invention and is suitable for people of all age, shape, and size. By replacing the brass or rubber tips on your sticks or crutches with our ergonomic and flexible Flexyfoot ferrule, you will not only extend the life of your walking aid but you’ll also benefit from less pain and discomfort and feel more safe and secure as you walk. The Flexyfoot is a direct replacement for your old brass or rubber ferrule and brings many additional benefits. These include absorbing the shock of impact from constantly placing the stick into contact with the ground (thereby reducing stress on your wrists and arms), offering superior grip on slippery surfaces and increasing your range of movement. When your Flexyfoot Extra is worn, you can replace the foot. 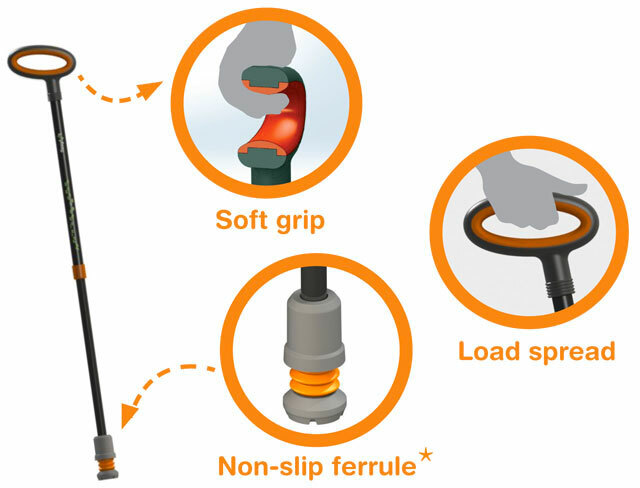 The Flexyfoot Extra foot is especially suitable for crutches. It has two fitted rings for extra suspension for very active and full weight-bearing users. It can be fitted to any Flexyfoot collar and comes with a grey or black tread, collar not included. To view the replacement tip click here. Height Adjustment 690 min to 970mm (27 in x 38in) max. Suitable for users between 1.55M and 2.0M tall (5ft 1in x 6ft 6in) (based on EN ISO 11334-4). Note: The stick will be supplied in two parts for easy self-assembly. I received my new flexi tip walking stick today and wanted to say how pleased I am with it. I shall definitely recommend you to my friends. Merry Christmas. Delighted with my purchase and the service I received. 3rd of three of these that I now have and the second with the oval handle. Much better grip than the cork and much more stabilising. Great product and a reasonable price compared to the company that designs and sells them too. Best walking stick available! The handle is perfect for my arthritic hands, and the foot makes walking with a cane, so much easier. Best of all was Active Mobility Centre’s response to my order. They have the best customer service ever, and the shipping was super quick tio the U.S. Thank you so much for all your help, and fantastic service.